The Vandals have a reputation for wanton violence and destruction but was there more to them than that? Barry Ager explains how new archaeological discoveries might help us to see them from a more balanced perspective. One Vandal by the name of Stilicho served in the West Roman army and even rose through the ranks to become its commanding general and the power behind the Imperial throne. He married Serena, a Roman citizen from a prominent family, and did his best to defend Italy and Rome from attack in this turbulent period. But, he was murdered in 408 on the orders of an emperor who was mistrustful of his ambition. There followed a brutal massacre of ‘barbarian’ women and children at the hands of Roman troops. Now, we might well wonder who the real barbarians were in these events. The Vandals were originally a farming and cattle-herding people who had migrated from Central Europe to escape from outside pressure on their homeland, caused by the inroads of the nomadic Huns in the early 5th century. They eventually went on to conquer and settle in the Roman provinces of Africa, in what are parts of Tunisia and Algeria today, making their capital at Carthage in 439. But, we should not forget that they had been left with little choice – when military conflicts in the province of Hispania (modern Spain and Portugal) made the situation too dangerous to stay, it became a fight for survival. They had already spent around 30 years within the Roman Empire and must certainly have been impressed by its wealth and cultural achievements. They would have wanted to participate in its prosperity, not kill the goose that laid the golden egg. We tend to forget that, whatever their origins, the Vandals had been previously converted to Christianity, adopting the Arian creed, which held sway at the time. It was only later that Arianism, which regarded Christ as secondary to God, was declared heretical by the Roman Catholic Church, with the unfortunate result of setting the Vandals in religious opposition to their subjects. This was not the first time, however, that there had been bitter religious strife in the region, as witnessed by the earlier disputes between Catholics and Donatists. Indeed, the latter, who made up a sizeable proportion of the population, may have welcomed a change of rule, according to one eminent historian. The sack of Rome certainly did the Vandals no favours. Although their main aim was to seize treasures, they also took thousands of Romans captive. But, in spite of the political upheaval caused by the establishment of their kingdom, the region of North Africa that had fallen under their control remained prosperous and economically stable, even if at a reduced level. The Vandal kings minted coins of silver and bronze for trade, although this suffered to some extent following the decline of the market of Rome after 455. Nevertheless, fine ceramic tableware and amphorae for wine and olive oil continued to be manufactured in Roman tradition and were still exported as far as Rome itself and western Britain. There is only limited evidence of destruction at towns or villas, such as Carthage, Koudiat Zateur and Thuburbo Maius, although there was some ruralisation and a number of forums fell into disuse and some streets were built over. Also, there does not appear to have been any decline in identifiable rural sites until after the Byzantine reconquest. Agriculture, grain and olive oil production continued. Except at court, the Vandals adopted Roman fashions and the way of life of the province in which they had settled. Vandal kings and nobles patronised the arts and the historian Procopius tells us they loved fine clothes, music, hot baths, the theatre and the Roman aristocratic pursuits of hunting and horse-riding. However, they seem to have made little effort to integrate themselves and formed a ruling elite. Former Roman administrators served in the government and still sealed documents in the Roman manner. 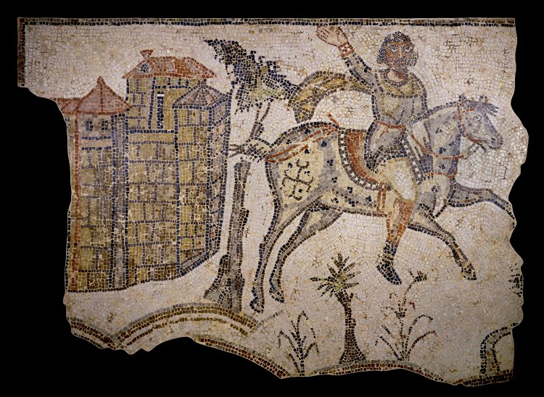 Vandal building projects include Hilderic’s palace at Anclae and the poet Luxorius mentions the splendid, well-watered pleasure garden belonging to one Fridamal. If you get the chance to visit the Museum’s new gallery Sutton Hoo and Europe AD 300–1100, look up on the wall at the mosaic from near Carthage, which may show a Vandal landowner riding out in front of his villa. The Vandals continued to maintain the aqueduct at Carthage and the churches that had been taken over for Arian worship. The discovery of a hoard of garnets from Carthage, including cut stones, suggests that there was a workshop producing cloisonné jewellery locally in contemporary style. The Albertini tablets from southern Numidia, a group of inscribed wooden tablets recording mainly land sales of around AD 490, show that literacy survived and that there was legal and administrative continuity during the Vandal period. The tablets are now in the Musée National des Antiquités, Algiers. Although we might find it hard to exonerate the Vandals, particularly for the sack of Rome and the persecution of the Catholics of North Africa, new archaeological discoveries help us to see them from a more balanced perspective. Indeed, even Victor of Vita, who recorded the persecution, acknowledged that not everyone shared his views. Furthermore, after the final defeat of the Vandals by the Byzantine army in 534, it is said that many provincials hoped for their return, because they had reduced the high level of taxation under the Roman Empire. In other words, had the Vandals been As much sinned against as sinners? The Sir Paul and Lady Ruddock Gallery of Sutton Hoo and Europe AD 300–1100 recently opened after a major redisplay in Room 41. Admission is free.